Do wind turbines disturb migratory bird patterns? What are the possible implications for tourism? Why don't we just put all the wind turbines out to sea, i.e. invest in off-shore development? How long does it take, on average, for a wind turbine to pay back the cost of installation? How long does it take, on average, for a wind turbine to pay back the energy or carbon cost of manufacture? Before a wind farm is given planning permission, a strict Environmental Impact Assessment (EIA) must be undertaken and investigations into any possible disruption of local environment or wildlife must be conducted. If the proposed site turns out to be on a path along which migrating birds frequently fly, the site may be adjusted to eliminate adverse impacts on the bird’s migrations. Available evidence suggests that appropriately positioned wind farms do not pose a significant hazard for birds. Migrating birds also usually fly at heights of 150m above the ocean or land, which is higher than most wind turbines. 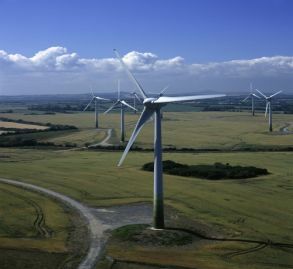 As regard the risk to birdlife generally, the British Society for the Protection of Birds has stated that "The available evidence suggests that appropriately positioned wind farms do not pose a significant hazard for birds." Wind turbines are not noisy. The evolution of wind farm technology over the past decade has rendered mechanical noise from turbines almost undetectable with the main sound being the aerodynamic swoosh of the blades passing the tower. There are strict guidelines in the planning regulations on wind turbines noise emissions to ensure the protection of residential amenity. It is possible to stand underneath a turbine and hold a conversation without having to raise your voice. As wind speed rises, the noise of the wind masks the noise made by wind turbines. Why not visit a wind farm and experience it for yourself? The report involved the identification of the number of tourists that would be affected, the reactions of those tourists affected, and the economic impact of those reactions. In summing up the findings of the study the authors report that, "....our overall conclusion is that the effects are so small that, provided planning and marketing are carried out effectively, there is no reason why the two are incompatible..."
The old fashioned windmill is viewed with nostalgia, and some people prefer the look of them to that of their modern counterparts. Just because wind turbines are modern, it doesn't mean they won't look just as good over time. A modern wind turbine is simply an improved windmill. Every aspect of their design has been optimised, making them far more efficient than old style windmills at generating electricity. To make them look more old-fashioned would result in more expensive electricity. We will need a mix of both onshore and offshore wind energy to meet Ireland’s challenging targets on climate change. At present, onshore wind is more economical than offshore development. Furthermore, offshore wind farms take longer to develop, as the sea is inherently a more hostile environment. Here in Ireland we are lucky enough to have good winds both on and offshore. Ireland's first offshore wind project, the Arklow Bank Wind Park in the Irish Sea, is now in operation. Erection of the project’s seven GE 3.6-megawatt machines, was completed in only nine weeks. Located around 10km off the coast of Arklow, Ireland, the project's seven GE 3.6 MW wind turbines are the world's first commercial application of offshore wind turbines over three megawatts in size. The project is being co-developed by Airtricity & GE Energy. There are many different factors which have to be taken into account when estimating the time it would take for a turbine to pay back the cost of its installation. Key factors that will influence this time period will include wind speed, connection cost, the actual price you'll pay for your turbine, your debt-equity ratio and the terms of your PPA agreement. Due to the wide variabity of these factors and the length of time over which payback revenue will be spread, a payback period of anywhere between 10-20 years is the most likely time window before the initial invest costs have been recovered. Recent reports estimate that the time required for a turbine to be in operation to restore the energy balance or offset the carbon cost is between 3-5 months of operation. • there is enough wind energy to ensure that the turbine blades are moving. Irish wind farm sites are generally not likely to encounter significant shadow flicker. For those sites that are affected, the potential for flicker can be calculated prior to construction and turbines can be sited to minimize impacts on residences. Where shadow flicker is anticipated to lead to potential problems, measures can be implemented to mitigate these effects. Wind turbine control software is available, which can turn the relevant turbine off at these times if it is an economically feasible option. Other mitigation measures could include the provision of screening measures, where this is acceptable to the relevant householder. The assessment of potentially sensitive locations or receptors within a distance of ten rotor diameters from proposed turbine locations will normally be suitable for EIA purposes. A guideline of not more than 30 hours of shadow flicker per year is suggested for dwellings.